Go ahead, be silly today. They don't know your dance moves aren't cool anymore! Before we know it these silly days will be long gone :( Enjoy it while it lasts! What an optimist you are! That's the best take on this May snow that I've heard all day!! Silly is such a good goal. I like it. I can't believe you have snow!!! You need to move over this direction. The sun is out and it's 63 degrees right now! 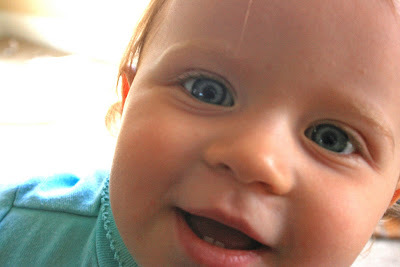 I'll send you some sunshine :) BTW your daughter has the biggest blue eyes!!! Totally gorgeous!